One of the great things about blogging is how versatile it is. There’s no right and wrong way to blog. A good blogging program will be molded to best meet the needs of your students and school community. However, it’s always interesting to see what others are doing to get new ideas and perspectives. Last week we shared Becky Versteeg’s story of blogging with young students. It was an inspiring look at the many benefits that blogging can offer students in their first few years of schooling. For educators who are working with older students, we want to provide a case study for you too. 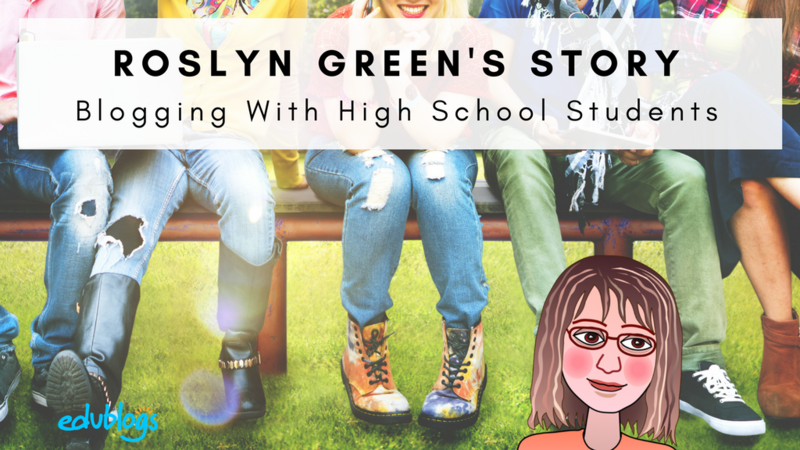 Roslyn Green kindly allowed us to interview her recently for our Better Blogging With Students Course. We’re cross posting this interview here on The Edublogger to share her excellent insights with a larger audience. Roslyn is a secondary school (high school) teacher from Melbourne, Australia. She uses Edublogs and a CampusPress platform to blog with a number of her classes in different ways. 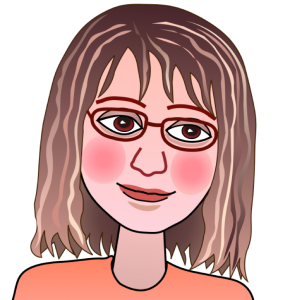 Although I had actually completed an Applied Diploma of Science in Computing in the years before gaining a full-time teaching position, I don’t think that really helped me with blogging. Perhaps it made me believe that I could figure out how to solve problems along the way. I was pre-wired to be a total nerd, even back then! I finally gained an ongoing position at Box Hill High School in 1990. It was there that our librarian, Dee McQueen, initially mentioned the concept of blogging to me. She had decided to create a blog for the library and I was immediately taken with her idea. In fact, permanently hooked! At that time, in 2008, blogging was much trickier: the software was far less intuitive and the options relatively limited. My aim initially was to help my history students find their way through the labyrinth of the internet by recommending worthwhile sources to them and directing their research. You now have four blogs for various classes. Could you tell us about them? The first blog I set up in around 2008 was for History (basically Year 7 and 8), because I found it to be a useful platform from which to guide students to the most reliable and worthwhile websites. My English blog is only a year old, but I have really enjoyed developing it. I have tried to upload all my handouts and internet activities to it, so that students and other teachers can find them and use them. Many of my students have also written very thoughtful comments on various topics. I had a wonderful Year 8 group in 2017. My Psychology blog is rather inactive at the moment, though I devoted many hours to adding posts in 2016 with the new course for Year 11. Since then I’ve just made a few little adjustments but haven’t changed much. 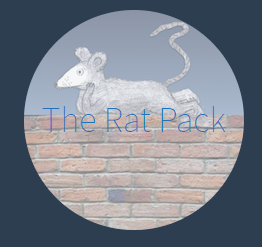 The blog is called “The Rat Pack” and my original byline was “No rat was harmed in the making of this blog”. There are links to the whole course that I have taught, including to all my handouts, online activities (such as quizzes and Kahoots) and explanations of various topics. The name for my German blog “German Island”, derived from a German word that translates in English to “Language Island” and refers to a little group of people who speak a particular language. I started to learn German in the middle of 2009 and created the blog about 3 years after that. I quickly realised that students would only visit it if they could undertake interactive activities on it, so I built it like a website, with a page devoted to each unit, each grammar issue, etc. Eventually each unit page included a downloadable PDF booklet, essential links, online activities related to that unit and sometimes audio clips as well. This is an example of a unit page for an accelerated Year 7 class. How do your blogs operate? How do you encourage commenting? At the start of the year, I ask my students to find and save the address of the appropriate blog. During some (but certainly not all) classes, I direct them to particular activities or questions on that blog. This varies significantly from subject to subject. For History, the blog is often a springboard to research, videos, and quizzes. For German, I spend almost the whole time with students in face-to-face interaction, so the blog serves as a place for students to go later to consolidate what they’ve learned in class. Sometimes I create Wikis of class notes that they can read through to revise. I often place a link to the material they should visit on “Compass” (our school’s internal network). Student comments are more appropriate for History and English than for my two other subjects. For History, I might ask students to read several web pages to which I have provided links and then write a paragraph on a tricky, challenging or intriguing historical question, such as: Which factors might have contributed to the dying out of the Neanderthals? OR: In what ways did the development of farming enrich humanity? What kinds of disadvantages can you also identify? Sometimes I ask students to comment on an activity that we have completed, which is an ideal way to gain thoughtful feedback. I moderate ALL comments and usually correct the most heinous English errors. Last year I asked students in my English class to write a farewell comment to our retiring principal, and many of their comments were mature and touching. My favourite comments, however, were the ones that I never intended to elicit, from my little History class last year, who wrote me comments at the end of Semester 1 to thank me for teaching them. I always ask students to draft their comments in Word, because sometimes a comment can be lost in the ether; if they have spent a long time drafting it, this is naturally upsetting for them. They require quite a bit of time to write thoughtful comments. This is not a quick five-minute activity. How has your approach to blogging changed since you first began? My blogging has changed significantly since it became possible to create more interactive content through quizzes and the like. I try to write in a personal way to students, but I remind them not to be too personal in their own comments. They are only allowed to write their first name and I rarely if ever have photos of students on the blogs. I used to include photos early on, but I soon abandoned this idea, since publishing photos became a charged issue over time. I’m wary of putting anything on my blogs that might identify an individual student. Sometimes I upload pictures of their work after trimming out family names. Are there any particular tools that you could recommend to make content more interactive? https://www.learnclick.com – Cloze activity maker, along with other types of quizzes. You can embed pictures, audio and videos in the quiz and then embed the whole quiz in your blog. https://kahoot.com – Online multiple choice quizzes → I place links to the class and the preview version of the quiz on my blog. Students need a membership with Kahoot in order to play the preview version. https://quizizz.com – Another online quiz-making site with the possibility of adding teacher-made memes (a built-in time waster for teachers!). https://www.sugarcane.com – Create a data set and then make up to 18 activities based on it (excellent for revision and differentiation). https://edpuzzle.com – I have just found this one and can’t wait to begin using it. You can create simple quizzes based on YouTube videos. https://www.proprofs.com – Another quiz maker, but relatively expensive; search for the education package, which is cheaper. https://tinycards.duolingo.com – I make a set and place a link to it on my blog. This is also an excellent activity for students. The flashcard-making software is built around the Duolingo program. https://www.podbean.com – You can create a podcast and embed episodes in your blog or put links to your episodes (or those read by students) on your blog. https://learningapps.org – Create your own activities (e.g. crosswords) and embed them in your blog. Use the HELP function to ensure that students can find possible answers even when you’re not present. I sometimes make my own pictures (such as my avatar) on Keynote (an Apple presentation product). This takes a fair bit of practice, but is strangely soothing and infinitely adaptable. (Note: Check out Where To Find Free Images For Teachers And Students for more suggestions of royalty free and Creative Commons Zero images). Do you have any other tips you could share for high school teachers who want to get started with blogging? Students need to be directed clearly on what to do with your blog materials. Don’t believe all the drivel about them being “digital natives”: they need explicit and precise advice, because they are nowhere near as savvy with this kind of site as with mobile phones and the like. I give them specific step-by-step instructions and nearly always have to repeat them for some students. Students tend to view the internet as a playground, rather than as a serious learning environment. It is a good idea to speak to younger students about being safe and secure on the net by only putting their first name into comments, not mentioning their school or suburb, etc. Think about whether you want your blog to be based on POSTS (dated, one after the other) or PAGES (more like a website). My history blog is post-based, while my German blog is page-based. You can mix the two: posts for day-to-day content; pages for content that is relatively unchanging, like “Downloadable Handouts” or “Online Activities”. Think up an imaginative name for your blog and make sure that your URL is exactly what you want it to be – it’s the one and only thing that you can’t change afterwards. The name can be changed, but the URL can’t. Blogging is a lot of extra work but it helps the creator too. I believe that I have improved my abilities as a writer and a teacher by developing my blogs. They also allow me to share my work easily with other teachers and find something I did years ago. I am gradually uploading all my handouts in PDF form so that other teachers can help themselves. In a way, my blogs serve as an online brain backup! We want to offer Roslyn a big thank you for sharing all these tips, tricks, and experiences with us. Roslyn has demonstrated that blogging can be incorporated into all sorts of subject areas. She also shows that there are many ways to involve students in blogging programs, and you don’t necessarily have to have individual student blogs. Do you have any comments or questions for Roslyn? 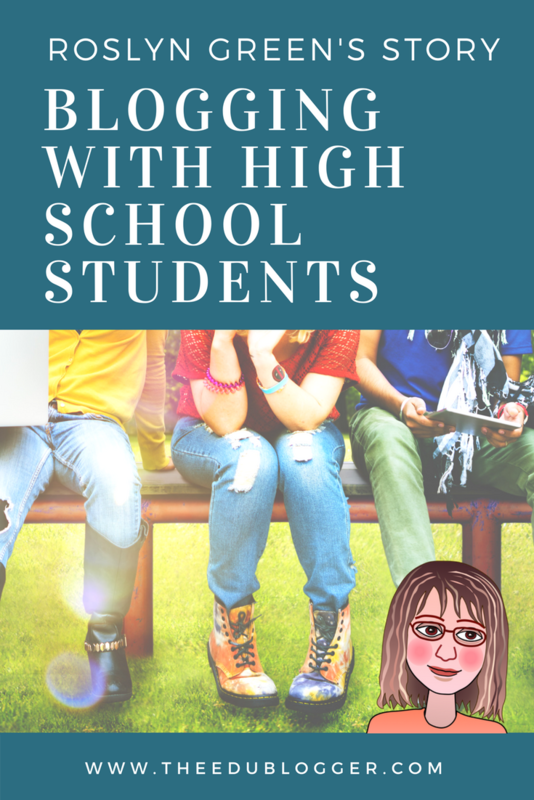 Do you blog with high school students? Tell us about it. I loved looking at Roslyn’s blog and now have more ideas of my own. But, I am questioning whether I should have had my students create their own blogs at this stage of the game for me, a novice. I am thinking it may have been better to use my classroom blog for them to work and learn from?? Hmm, but I have dove in head first, wondering how I combat this or if I keep plowing forward? P.S. I think I need to spend far more time exploring what she has done with her various blogs. This is a good question. There’s really no right or wrong answer. While I personally liked having a class blog before student blogs, others dive straight into student blogs from the start and it works out wonderfully for them! I think the main thing is that if you start without any student involvement, it’s good to eventually get the students involved — even if that’s just through comments and interactive content, like Roslyn. 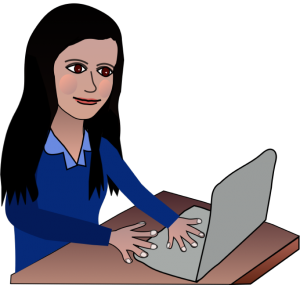 As for your dilemma, you can always start slowly with the student blogs. Even if they just publish once or twice a month while also being a part of the class blog. That might work well?